How do I convert PDF to PDF/A? - No preference of operating system to run the script or program. you can try a web service like this one (2mb limit though), and almost all commercial editors allow you to save in PDF/A in either the Save As ... feature or the document properties. I was able to get what I was looking for using an open-source PDF printer by the name "PDFCreator". Embedding all fonts in a PDF is not the same thing as having a file that complies with the PDF/A (ISO 19005) set of standards. Compliance with PDF/A requires many more features of PDF to be enabled (or disabled) accordingly. Not the answer you're looking for? Browse other questions tagged pdf script fonts printing embedded-fonts or ask your own question. Why are my PDF files printing differently? 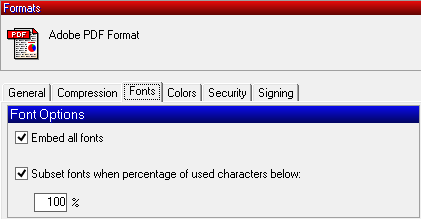 How does a Windows program know if I'm printing to PDF? True vector PDF printing in Windows 7 possible? How to embed fonts in a pdf or pptx document? Is it possible to print a PDF with a heavier font?